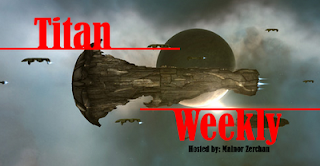 There's a new EVE podcast on the block folks, and it's called Titan Weekly! I first heard about Titan Weekly late last week, when I came across a comment made by fellow Drone Bay co-host Crovan. This was then followed by Urban Mongral who mentioned the show on the last WDA podcast. Fellow EVE player Malnor Zerchan just published his 3rd podcast earlier today, and though the show is still very wet behind the ears, you can definitely see that the quality of the show has improved in the short time since the first episode aired, two weeks ago. The shows are compact (Ep. #3 is just under 15min) as Malnor jumps quickly into the core of the subject, without any unnecessary fluff. The purpose of the show is to provide you with a ONE STOP location to get all the major news going on in the EVE Universe, in a small 15 to 20 minute podcast, that you can listen to at work, or on your way to work, and just sitting at home, as Malnor tells us. I certainly look forward to the next podcast and wish him all the best! Make sure to give him some feedback while you're there! Hey CK, where can Titan Weekly be found now? I get a 404 when I click through on your link. He's moved them so many times, I've lost track of them! Sorry! WDA: Industry #7 is out! Warp Drive Active #40 is out! EON Issue #012 should be here any day now!